The 2011 WIN photo competition focused on the precious value of water as well as the dangers of badly managed water in urban settings. Estimates suggest that by 2030, 5 billion people will be living in cities, where corruption can have a devastating effect on water quality and water distribution. The Water Authority installed free clean drinking water outlet for the poor living around Gulshan, Dhaka. But as normal corrupt practice in Bangladesh would have it: people have to pay! 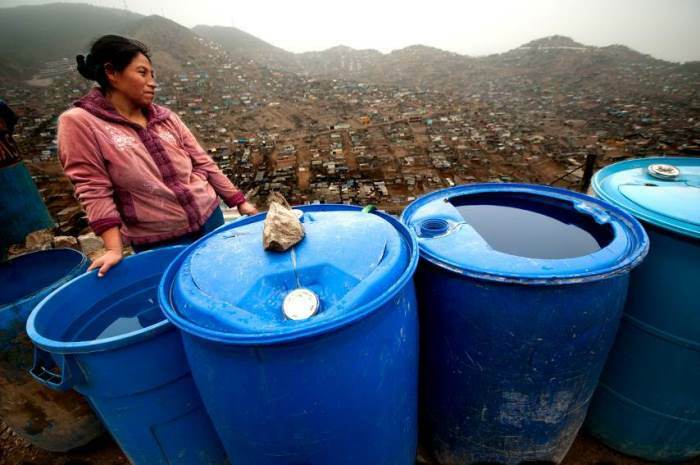 A woman in Pamplona Alta, Lima – Peru, next to the big blue drums they use to fill with potable water that trucks deliver to them every two days. This water is at least four times more expensive than water other people usually have at home. 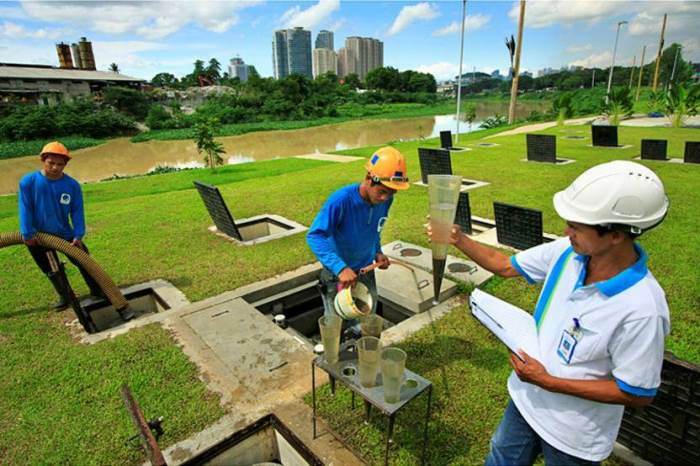 Water treatment: As part of an effort to rehabilitate the Pasig river, a sewage treatment plant was constructed in Marikina city (Phillipines) where waste water collected from residential and commercial establishments is treated and recycled. 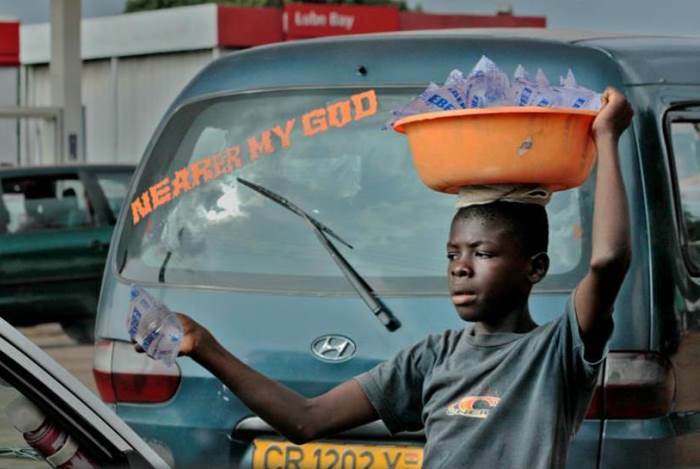 A boy sells drinking water in packets, in city of Kumasi in Ghana. The message on the back of the car adds a touch of meaning to his job. Summers in India is a real monster and there is a lack of pure water. This picture is from Eastern India in Kolkata. These people are called visti. 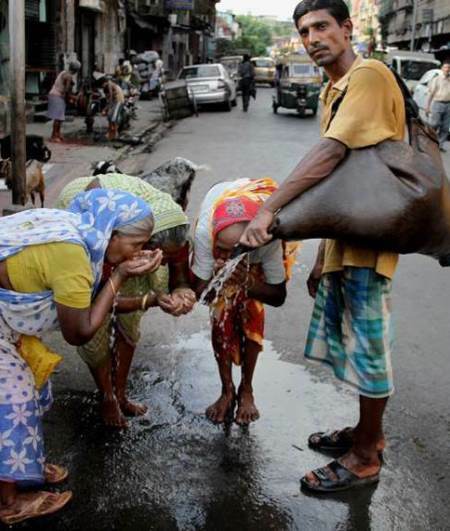 They carry pure water in leather pouches which can contain gallons of water that quenches the thirst of people. In India we believe that quenching thirst gives us blessings and these vistis are living their life with the blessings of thirsty people. 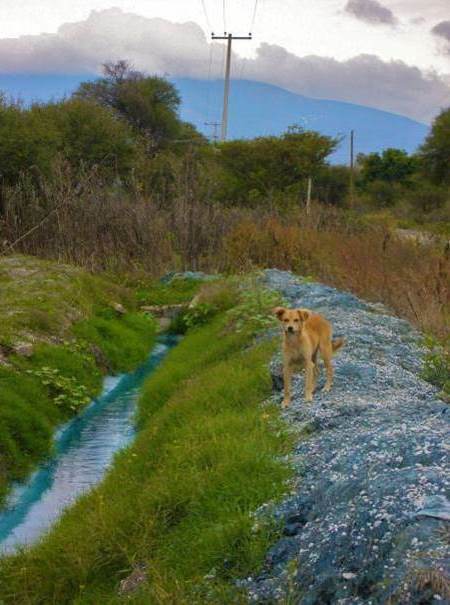 The blue jeans factories in the region of Tehuacan, Puebla, Mexico. The industrial processes used are quite toxic to workers and employ millions of litres of water taken out illegally from underground. After the completion of the process, contaminated water is just thrown onto the field. 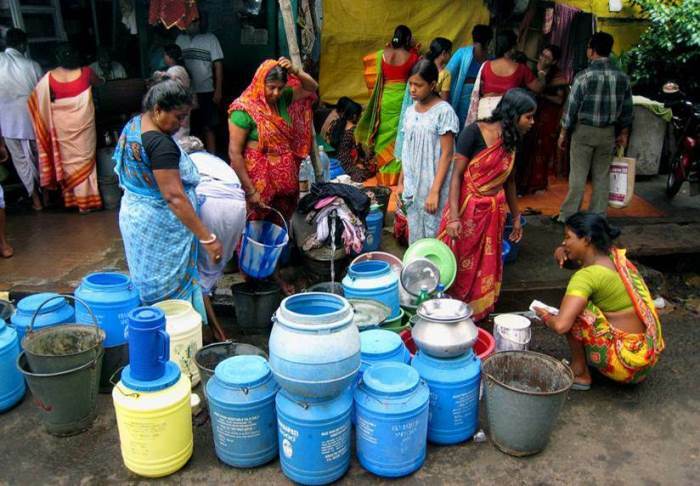 Queue for life: Slum dwellers, in Kolkata city of India who don’t have access to a separate supply, are queueing to collect water for daily use from the roadside tap arranged by the local municipality. 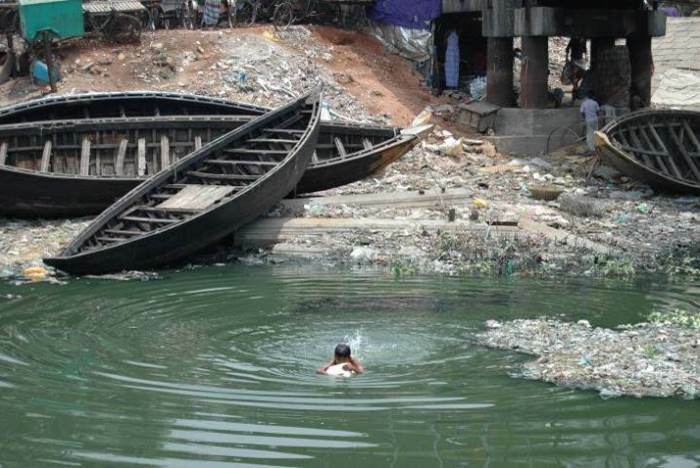 Buriganga, the main river flowing beside Dhaka city, capital of Bangladesh, is now one of the most polluted rivers in Bangladesh because of rampant dumping of industrial and human waste. 40-50 years ago, a cruise on the historic Buriganga River in the capital used to be a must for visiting dignitaries. 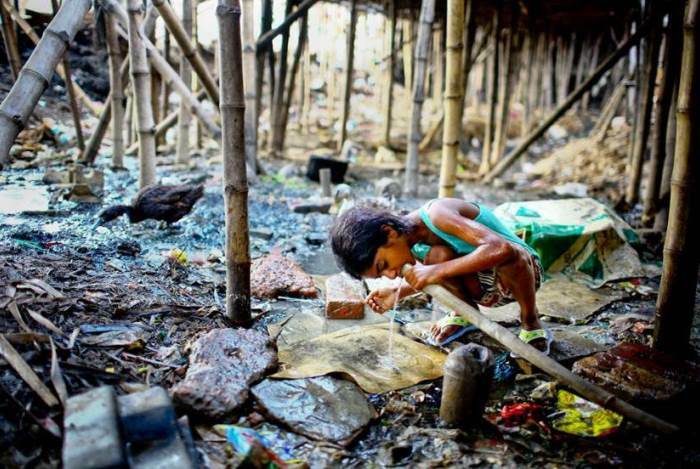 It was once the main source of drinking water for Dhaka residents. These days visitors are confronted with foul smells and rotting fish caused by massive pollution. This stench is unbelievable. According to the Environment Department, up to 40,000 tons of tannery waste flows into the river daily, along with sewage from Dhaka, a city of more than 10 million. Illegal structures have sprung up along its banks, narrowing the river and adding to the dirt, whilst ferries spill oil into its waters. It is now a dying river and the situation will get worse unless steps are taken urgently to reverse the trend. 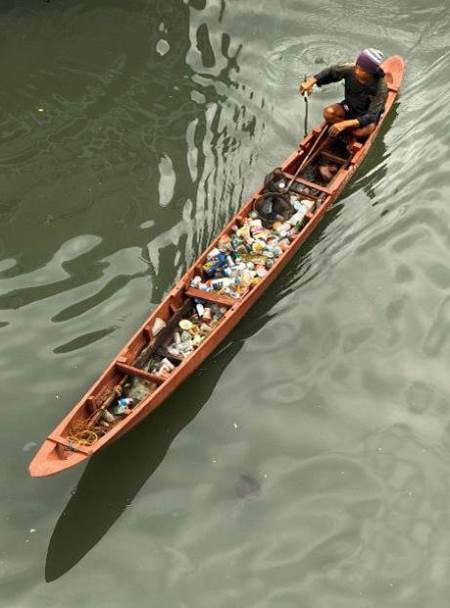 A dedication to Mr. Rahmat, who lives near the riverside, to keep the Anai River in Padang City, Indonesia, clean.